Just finished Robert Olmstead’s new novel, and I’d recommend it to anyone who enjoys gritty war novels. It’s the story of 14-year-old Robey Childs during the Civil War. After Stonewall Jackson is killed in May, 1863, Robey’s mother has a vision and sends Robey to bring his father home from the war before July, when, the reader knows, the Battle of Gettysburg will occur. Robey’s quest leads him through one episode after another of violence, and he gradually learns to reckon with the world as an adult. 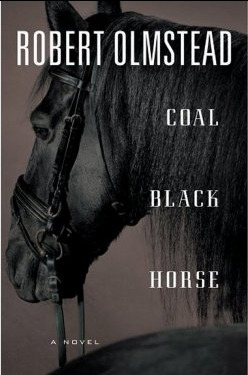 Olmstead writes at one point, “He also came to understand that he was finally finished with his believing in God.” Olmstead is writing in the tradition of The Red Badge of Courage (for subject matter), Cormac McCarthy (for style), and Cold Mountain (again for subject matter), but the vision in the novel is his own. It’s a very brutal, masculine world in Coal Black Horse, but flashes of tenderness, like heat lightning in the night, offer the reader something that resonates afterwards.